Microchip Technology recently released a demonstration platform for the lowest-power Bluetooth Low Energy (BLE) sensor node. 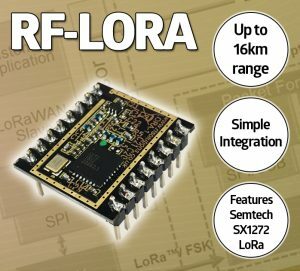 The platform features an ultra-low-power BTLC1000-certified module, a SMART SAM L21 Cortex-M0+ MCU, Bosch sensor technology, and a complete software solution. The BLE demonstration platform includes source code, hardware design files, a user guide, and Android application source code. An integrated BTLC1000-MR110CA BLE module, delivering at least 30% more power savings compared to existing solutions. An ultra-tiny 2.2 mm × 2.1 mm Wafer Level Chipscale Package (WLCP). A SAM L21 that achieves a ULPBench score of 185, with power consumption down to 35 µA/MHz in active mode and 200 nA in sleep mode. Bosch six-axis motion (BHI160) and environment (BME280) sensors that can be used for a wide variety of sensing applications. 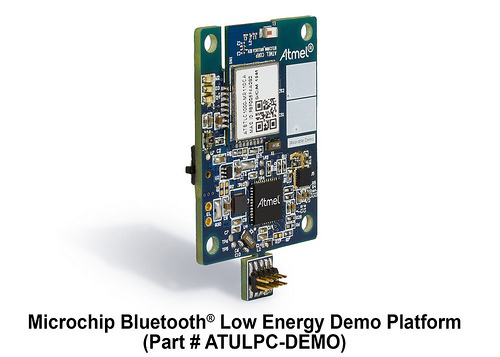 The Ultra-Low-Power Connected Demonstrator Platform costs $39. Security is one of the hot topics today in the Internet of Things (IoT). There have been well-publicized security breaches of consumer devices that include hijacked video from wireless baby monitors being posted on the Internet and home automation systems that reveal whether a home is occupied or not. A number of systems have been breached just to demonstrate their vulnerabilities. Less well publicized are security breaches of industrial equipment with much more severe consequences. These are rarely made public for obvious reasons. At first glance, it would seem that the existing security mechanism for the Internet and corporate networks would be an easy solution for IoT security. There are several problems with this. First, IoT applications only require security that is “good enough” for the specific application. Just like you don’t need razor wire and guard towers to keep your dog in the yard and don’t want to rely on a four foot yard fence to keep the prisoners in a maximum security prison, the level of security for an IoT product needs to be based on the needs of the application (often basic privacy rather than real security). Consider data encryption for network transfers as an example of why existing security mechanisms generally do not work well for the IoT. Encryption standards typically target applications that require extremely high levels of security such as financial transactions and military or national security communications. These encryption standards are severe overkill for most IoT applications and present significant problems for small, battery-powered IoT devices. An encryption algorithm may require upwards of 4 KB of code space, which is as much or more than many otherwise suitable microcontrollers might have. Many encryption standards rely on multiple rounds of encryption. The time it takes to perform the encryption could be several times longer on a small micro than the time it takes the micro to perform its main tasks. Most common encryption standards rely on 16- to 32-byte keys to help ensure data security. For many IoT devices, these key lengths could increase the length of their network messages by a factor of 4× to 8× or more. The execution time and added network traffic can quickly chew-up precious battery capacity, increasing the size and cost of a product. The extremely high level of security provided by these encryption algorithms is what drives the large code size, long execution times, and high message overhead that makes them inappropriate for most IoT applications. Hardware encryption addresses the code size and execution time issues but still suffers from high message overhead. The other major problem with using existing security mechanisms is IoT developers typically don’t have network security experience. There is a certain mindset and expertise required to develop IoT products and a completely different mindset and expertise required to be a security expert. The time required to develop these security mechanisms in-house could take several times longer than the basic product development. Several companies have recognized this problem and have recently introduced security framework products to be incorporated into IoT devices. True end-to-end security requires much more than just passwords and data encryption, and these framework products address other needs like key management and protection against common network attacks. These security frameworks may well be the future of IoT security, but to be widely adopted, they have to be right-sized for IoT devices. When selecting the wireless technology to use in an IoT product, things like distance, bandwidth, cost, and physical size have to be considered. Words and phrases like “streamlined” and “light weight” need to be kept in mind when assessing security solutions for IoT products. A feature-rich security framework product might be appealing, but many IoT devices provide simple functions and don’t need a plethora of features. They also can’t afford the memory space and execution time overhead (and power consumption) imposed by these unneeded features. Whether future IoT products are based on a security framework or in-house developed security, there will not be a one-size-fits-all solution. Security for successful IoT products will be right-sized for the hardware resources available and the needs of the application. 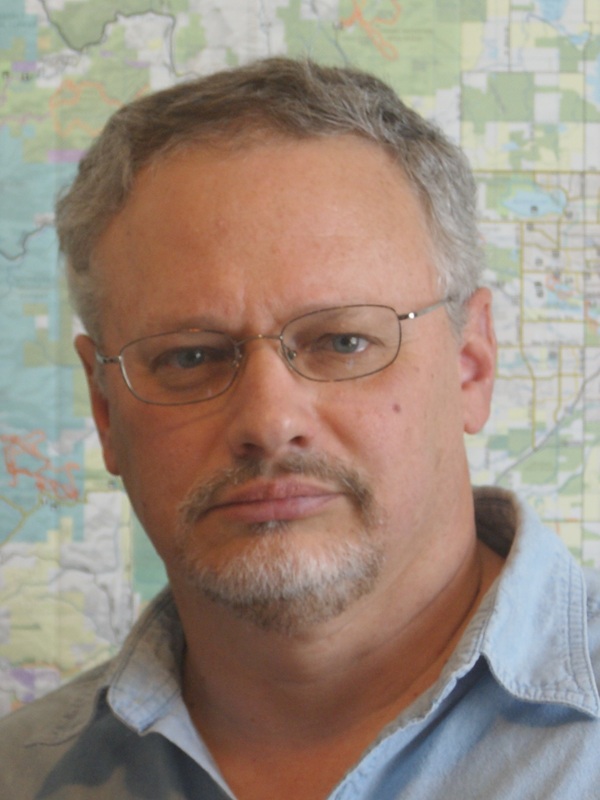 Mike Lease is a hardware/firmware engineer with more than 30 years of product development experience, mostly in embedded products. He developed a number of battery-powered, wirelessly connected devices before “IoT” became a common buzzword, and several more since then. Mike enjoys taking on tough challenges and has recently developed a fascination with generating random numbers. 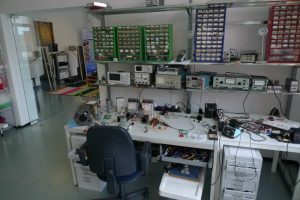 In 2013 he founded CMicrotek (www.cmicrotek.com) to develop a family of ultra-low current measurement products primarily for developers of battery-powered products. Mike recently launched LSE Technologies, a provider of lightweight stream encryption software for M2M and IoT applications. Jan Didden is a talented audio engineer and author with a well-stocked lab in Turnhout, Belgium. He recently gave us a tour of space and talked about his current audio design projects. This is an excellent place to work. It is a converted army barrack so, being an old army man myself, I feel comfortable here. Above me there is the Tax department and one floor below there is a medical department. I am safe from all sides. I have two rooms, one for studying and listening and one for all the projects and equipment. One of his current projects is an amplifier for electrostatic speakers. An electrostatic speaker works with a very thin foil to make the air move. To get that thin foil moving you need to apply a high voltage. That is normally done with transformers that transform the low voltage audio signal from the amplifier to a higher value. But a transformer is not a linear component and can introduce all sorts of distortion to the signal. The solution is to make an amplifier that produces a high voltage output directly, but there are not many transistors capable of providing these high voltages. He also described a project he might showcase on Kickstarter in the near future. My other project is very interesting for people who are using computers for measurement and testing audio. They all use a sound card (internal or external) but these cards have a limitation on the input voltage. That is typically around the 1 V. The project I am working on is an ‘auto ranger.’ It automatically scales the signal to measure to the right input voltage for the sound card. I think a lot of people will like that and I hope to make this product available, perhaps by making it a Kickstarter project. 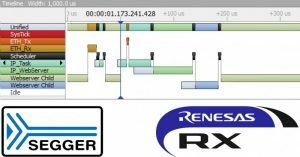 Renesas Electronics Europe and SEGGER recently announced their collaboration to facilitate the expansion of Renesas’s RX Family of 32-bit microcontroller ecosystem through the adoption of SEGGER’s newly-released SystemView software. SystemView supports streaming over J-Link, as well as real-time analysis and visualization, in relation to any Renesas RX-based embedded design. SystemView gives you insight into the behavior of a program. It offers cycle accurate tracing of interrupts and task start/stop in addition to task activation and API calls when an RTOS is used. It visualizes and analyzes CPU load by task, interrupts, and software timers. Using SEGGER’s J-Link debug probe with SystemView enables real-time analysis, which gives you an in-depth understanding of the application’s run-time behavior. SystemView uses SEGGER’s Real-Time Transfer (RTT) technology to ensure real-time delivery of data and minimal intrusiveness on the system. RTT enables up to 2 MB per second data transfer for continuous acquisition of real-time data, requiring no hardware other than a J-Link and the standard debug interface. SystemView records the data retrieved from the target and visualizes the results in different ways. You can save data recordings for later documentation and analysis. SystemView works seamlessly with SEGGER’s RTOS embOS, which includes all the necessary recording capabilities. SystemView doesn’t require any OS involvement. STMicroelectronics has successfully certified its cryptographic library for STM32 microcontrollers as per the US Cryptographic Algorithm Validation Program (CAVP). An extension to the STM32Cube software package, the X-CUBE-CRYPTOLIB library is well suited for secure STM32-based applications, such as IoT devices, point-of-sale terminals, and smart meters. The STM32 cryptographic library includes all the major security algorithms for encryption, hashing, message authentication, and digital signing. This enables you to meet application requirements for any combination of data integrity, confidentiality, identification/authentication, and non-repudiation. The library includes firmware and hardware-acceleration functions for some STM32 families. There are examples for each algorithm and template projects for popular development tools such as Keil MDK-ARM, IAR Embedded Workbench EWARM, and GCC-based IDEs (e.g., Ac6 SW4STM32 and Atollic TrueSTUDIO). The approved algorithms are AES (validation number 3971), RSA (2036), ECDSA (874), SHS (3275), DRBG (1165) and HMAC (2589). Full details are available online at the NIST CSRC Algorithm Validation Lists webpage. X-CUBE-CRYPTOLIB contains many further algorithms, including DES, TripleDES, MD5, ECC with key generation, ChaCha20, Poly1305, Curve25519 and others. The X-CUBE-CRYPTOLIB for STM32 is available free of charge under the terms of STMicro’s Software License Agreement (SLA0048). 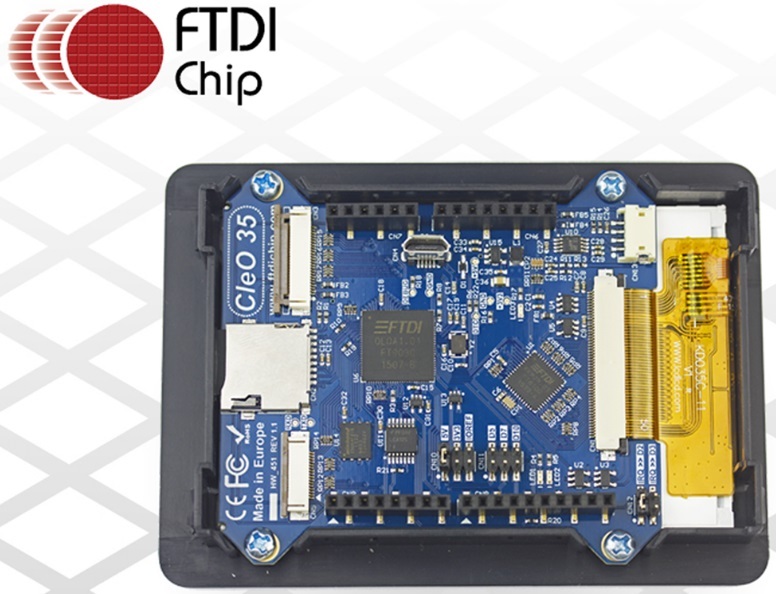 FTDI Chip recently announced the widespread availability of its originally crowdfunded CleO product (and accompanying accessories). FTDI Chip also offers access to software tools, step-by-step tutorials, and projects. CleO is a simple to program, intelligent TFT display solution that for building human machine interfaces (HMIs) with higher performance than typical Arduino display shields. The initial CleO includes an HVGA resolution, 3.5″ TFT display featuring a resistive touchscreen. 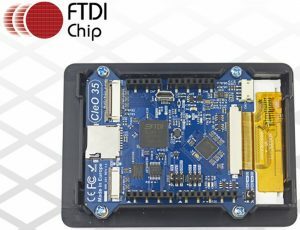 An FTDI Chip FT810 high-resolution embedded video engine (EVE) graphic controller executes the HMI operation. An FTDI FT903 microcontroller handles all the additional processing tasks. The advanced display shield provides high-quality graphical animation, even at 60-fps frame rates. In addition, its antialiased graphics capabilities render images in finer detail. When CleO is combined with FTDI Chip’s NerO—which is an energy-efficient Arduino design capable of operating up to 1 W—it offers a far more powerful solution than a normal Arduino UNO/display shield package. AT 57.15 mm × 54.35 mm, the CleO-RIO module provides a mechanism for stacking the CleO shield and an Arduino board together. The CleO-Speaker module (63 mm × 63 mm × 23.8 mm) facilitates the playback music/tones for HMIs where audio functionality has been incorporated. There is also an audio line for input of audio from external sources. The CleO-Camera module has an OV5640 0.25″ 5-megapixel CMOS image sensor plus flash LEDs and a 24-pin 0.5-mm pitch FFC cable. A 9-V power adaptor provides the NerO/CleO solution with up to 1 A of current. The CleO costs $69. Refer to FTDI’s new forum, www.CleOstuff.com, for design tips, application ideas, and more. The International Electrotechnical Commission (IEC) and USB Implementers Forum (USB-IF) recently announced that IEC has formally adopted the latest USB-IF specifications for high-speed data delivery and enhanced usages for device charging. 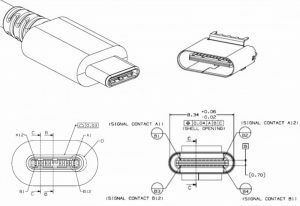 In particular, the USB Type-C Cable and Connector, USB Power Delivery and USB 3.1 (SuperSpeed USB 10 Gbps) specifications. 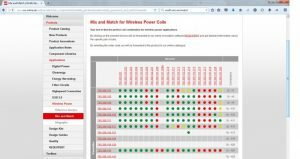 These specifications define a truly single-cable solution for audio/video, data, and power delivery. The standards are expected to advance global action on reducing e-waste and improving the reusability of power supplies with a range of electronic devices. The IEC approach for ongoing standardization work in this space is driven by the ultimate goals of increasing external power supply re-usability, supporting consumer convenience, maintaining product reliability and safety, and providing for future technology innovations. In addition, widespread adoption of the resulting International Standards will help to reduce the encroachment of poorly designed or manufactured aftermarket substitutes which may affect the operation of electronic devices in compliance with regulatory requirements. 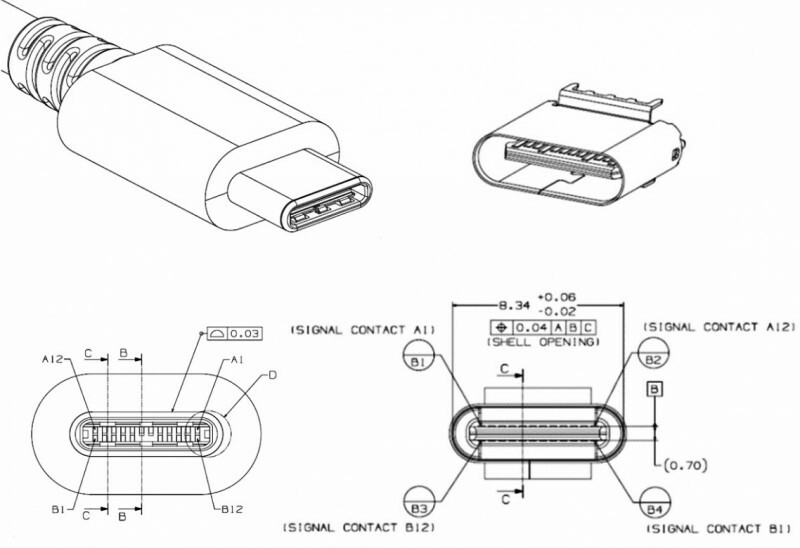 The USB Type-C specification defines the physical USB Type-C cable and connector form factor to facilitate thinner and sleeker product designs, enhance usability and provide a growth path for performance enhancements for future versions of USB. USB 3.1 enables speeds up to 10 Gbps, supporting audio/video for USB hosts, hubs, and devices. Combined with USB Type-C, USB 3.1 and USB Power Delivery define a truly single-cable solution for audio/video, data and power delivery, building on the existing global ecosystem of USB/IEC 62680 series of International Standards compliant devices. The International Electrotechnical Commission (IEC) brings together 166 countries, representing 98% of the world population and 96% of world energy generation, and close to 15,000 experts who cooperate on the global, neutral and independent IEC platform to ensure that products work everywhere safely with each other. The IEC is the world’s leading organization that prepares and publishes globally relevant International Standards for the whole energy chain, including all electrical, electronic and related technologies, devices and systems. The IEC also supports all forms of conformity assessment and administers four Conformity Assessment Systems that certify that components, equipment and systems used in homes, offices, healthcare facilities, public spaces, transportation, manufacturing, explosive environments and energy generation conform to them. IEC work covers a vast range of technologies: power generation (including all renewable energy sources), transmission, distribution, Smart Grid & Smart Cities, batteries, home appliances, office and medical equipment, all public and private transportation, semiconductors, fiber optics, nanotechnology, multimedia, information technology, and more. It also addresses safety, EMC, performance, and the environment. SiFive recently introduced the Freedom family of system on a chip (SoC) platforms that are built around the open-source RISC-V instruction set architecture, which was developed by the company’s founders at the University of California, Berkeley. Freedom U500 Series: The Freedom Unleashed (U) family features a fully Linux-capable embedded application processor featuring the world’s most advanced, multi-core RISC-V CPUs, running at a speed of 1.6 GHz or higher with support for accelerators and cache coherency. Designed in TSMC 28 nm, the Freedom U500 platform is well suited for machine learning, storage, and networking applications. The platform also supports standard high-speed peripherals including PCIe 3.0, USB 3.0, Gigabit Ethernet, and DDR3/DDR4. Freedom E300 Series: The Freedom Everywhere (E) family is designed for embedded microcontroller, IoT, and wearables markets. Designed in TSMC 180 nm and architected to have minimal area and power, the Freedom E300 platform features efficient RISC-V cores with support for RISC-V compressed instructions that have been shown to reduce code size by up to 30%. Full FPGA models of each SoC are now available. Visit dev.sifive.com for more information. 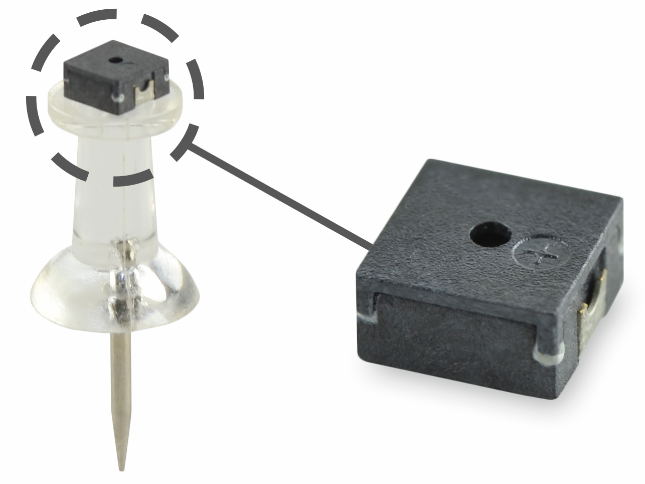 CUI’s Components Group recently expanded its micro buzzer product line. 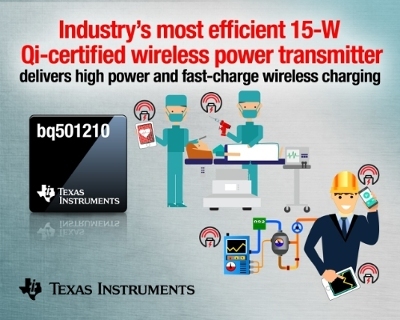 Housed in surface-mount packages as small as 4 mm × 4 mm, the three new models—CMT 4023S SMT, CMT 5023S SMT, and CPT 9019S SMT—are well suited for a wide variety of portable electronic systems. The CMT 4023S SMT and CMT 5023S SMT magnetic transducer buzzers are 4 mm × 4 mm and 5 mm × 5 mm, respectively. They have a rated voltage of 3 V and a rated frequency of 4 kHz. The 9 mm × 9 mm CPT 9019S SMT features piezoelectric technology and a profile depth of 1.9 mm. The series delivers a maximum peak-to-peak voltage of 25 V, a rated frequency of 4 kHz, and an SPL of 65 dB. Its operating temperature range is –30°C to 70°C. The CMT 4023S SMT, CMT 5023S SMT, and CPT 9019S SMT are externally driven and suitable for use in designs requiring reflow solder assembly for high-volume production. They are available immediately with prices starting at $1.08 per unit in 1,000-piece quantities. 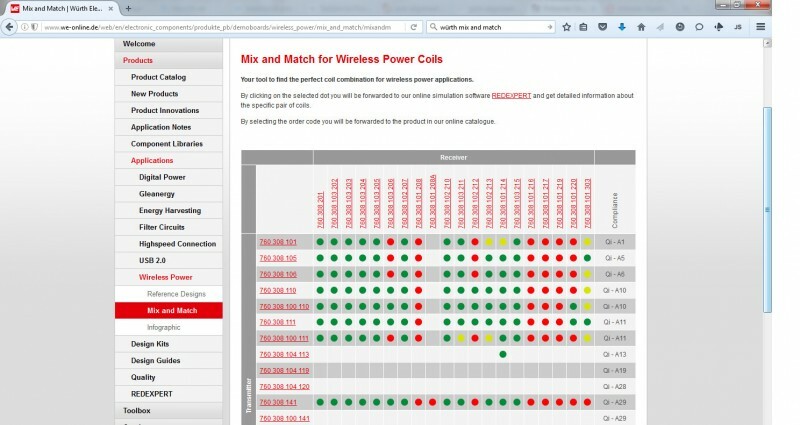 SEGGER recently introduced its emSSH software library for the purpose of creating secure connections between a client and a server, typically over a TCP/IP connection. The library is well suited for applications such as secure remote controls. emSSH includes all modules required for implementing SSH cryptographic networks. They are provided as source code and thus give complete code control. emSSH also delivers full transparency, which eliminates concerns about possible security issues. Its flexible crypto engine can make use of hardware acceleration (if available), and it comes with a powerful API. Hardware and transport independent, emSSH integrates with SEGGER’s em-bOS/IP and third-party stacks via the standard socket interface. You can configure the emSSH library to meet a variety of speed or size requirements. Unused features can be excluded and additional features can easily be added. The complete software package is written in ANSI C and it’s both compiler and target independent. 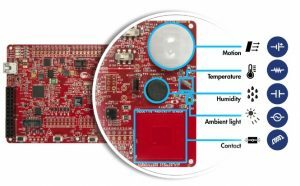 Cypress Semiconductor Corp. recently introduced a new PSoC that simplifies the design of next-generation, multiple-sensor systems. Based on a 32-bit ARM Cortex-M0+ signal processing engine, the Analog Coprocessor integrates programmable analog blocks, including a new Universal Analog Block (UAB), which can be configured with GUI-based software components. You can use it to continuously monitor multiple sensors, such as temperature, humidity, ambient light, motion, and sound. You can handle future design changes to support new sensor types by reconfiguring the programmable analog blocks. 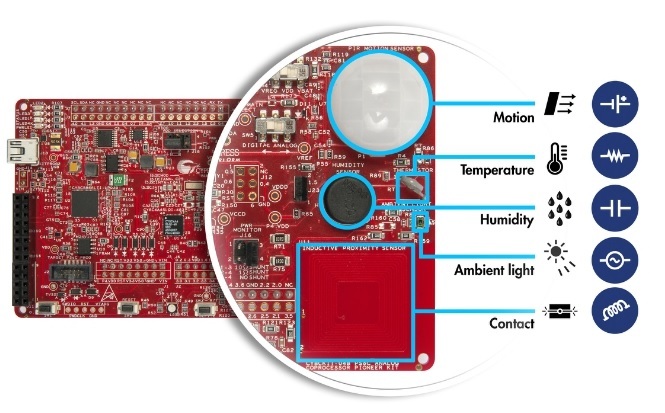 Cypress’s free PSoC Creator Integrated Design Environment (IDE) enables you to design custom sensor interfaces. You can simply configure the programmable analog blocks by dragging and dropping components on the PSoC Creator schematic and customizing them with graphical component configuration tools. The components offer fully engineered embedded initialization, calibration, and temperature correction algorithms. Available in a 3.7 mm × 2 mm chip-scale package, the PSoC Analog Coprocessor is currently sampling. Production is slated for Q4 2016.